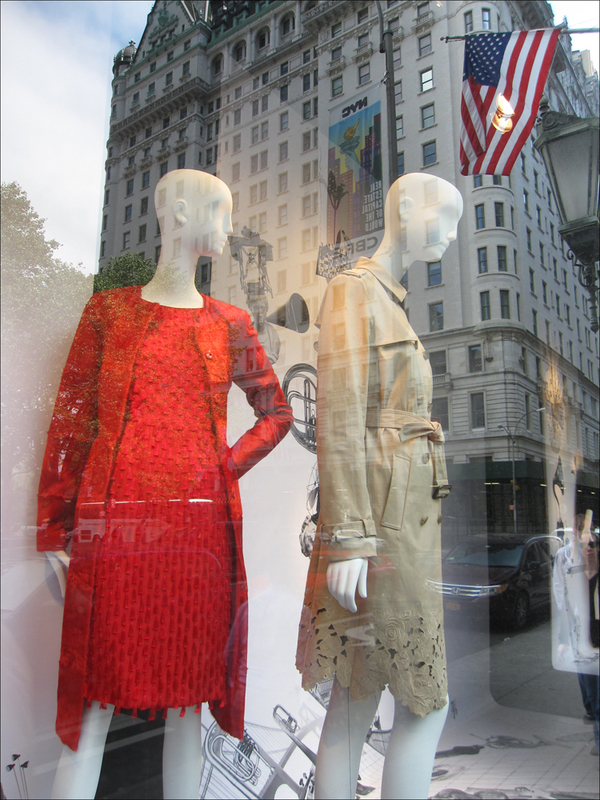 Let’s continue our window-shopping tour de force up Fifth Avenue. 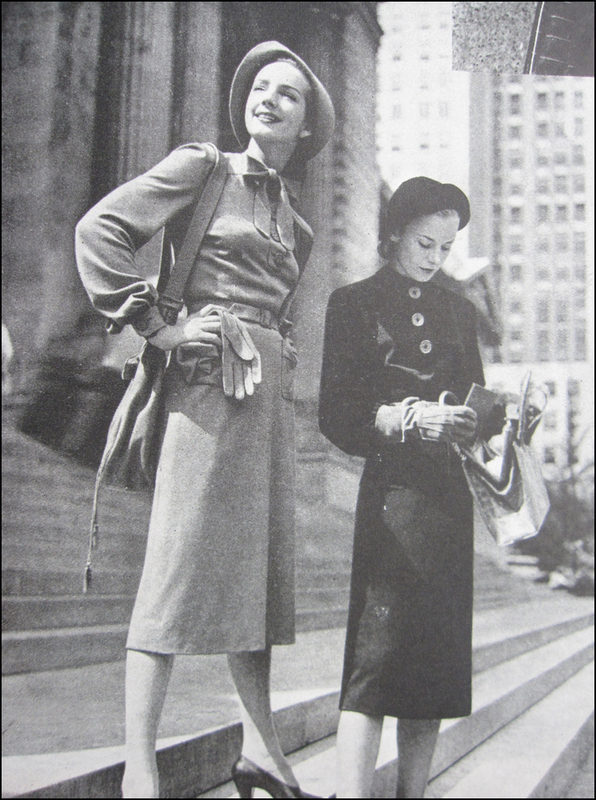 I’ll also include a few photographs taken by Anne Simpkins for Harper’s Bazaar in 1943. So grab your sunglasses, trainers and spare bills for salted pretzels and soda pops. Meet me at 30 Rock! What’s new on the Avenue? 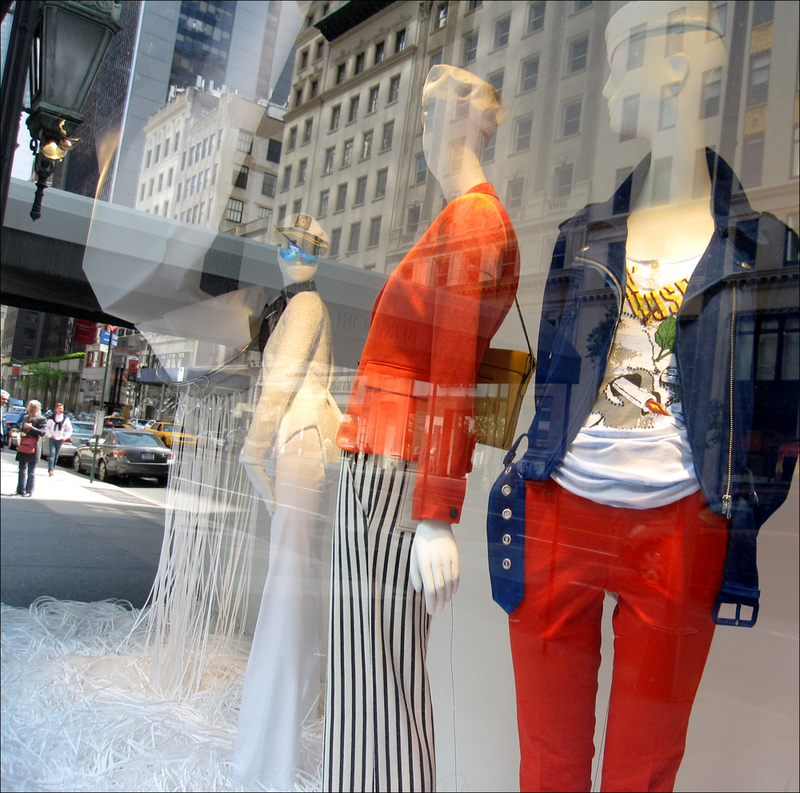 Here’s the squeal: Zara’s new flagship at 666 Fifth Avenue recently opened with a hi-tech, futuristic look, while Massimo Dutti will jump to Zara’s former 691 Fifth Avenue location. Meanwhile, the Elizabeth Arden Salon scooted to 663 Fifth Avenue, and MAC Cosmetics moved into E.A.’s former digs at 691 Fifth Avenue, across from the Fifth Avenue Presbyterian Church. Whew! This is the very spa where Anaïs Nin wrote, “The church bells are ringing while I sit at Elizabeth Arden’s on Fifth Avenue with my face covered by a mask, and I almost come near God again.” Now that’s a beauty treatment! First stop! Henri Bendel and its “street of shops” made the Fifth Avenue scene in 1990. Now saddling two historic buildings (the Rizzoli Building and the Coty Building), classic French glass windows by René Jules Lalique were recently discovered during the redo. Commissioned by perfumer Francois Coty in 1908, don’t you dare walk by the three-story Art Nouveau masterpiece without a little glass gazing! We have the late, great style icon (and store president for three decades) Geraldine Stutz to thank for giving Andy Warhol his first break when she hired him as a shoe illustrator. 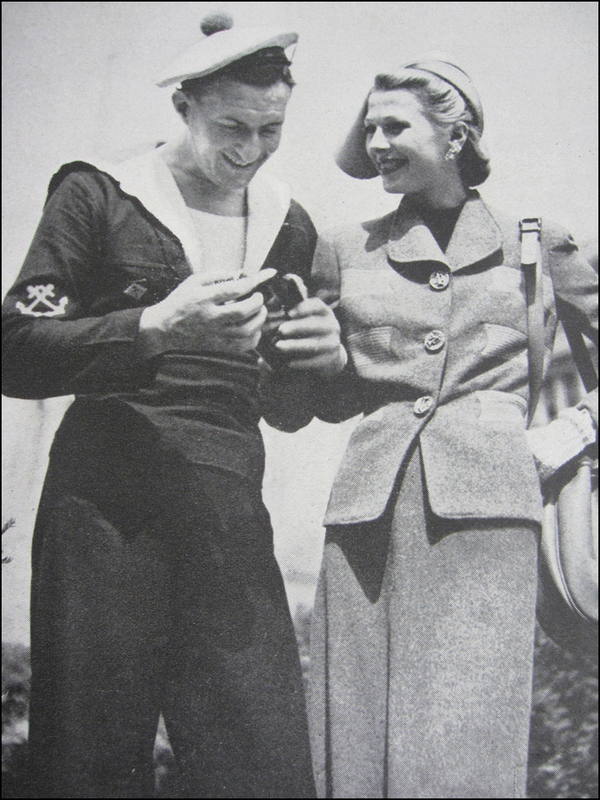 Stutz was also the first to feature European designers like Jean Muir and Sonia Rykiel. Fit for a king: Heck, even the Duke of Windsor shopped here! He also stored his New York wardrobe in the Bendel’s fur vault. Now that’s regal service! Golly, gee—glam! Get ready for your close-up because we’re approaching another sweet cinematic backdrop, perfect for your social media profile portraits. Created by Charles Lewis Tiffany and Teddy Young in 1837, Tiffany & Company made the big frog leap from 37th Street to 57th Street in 1940. 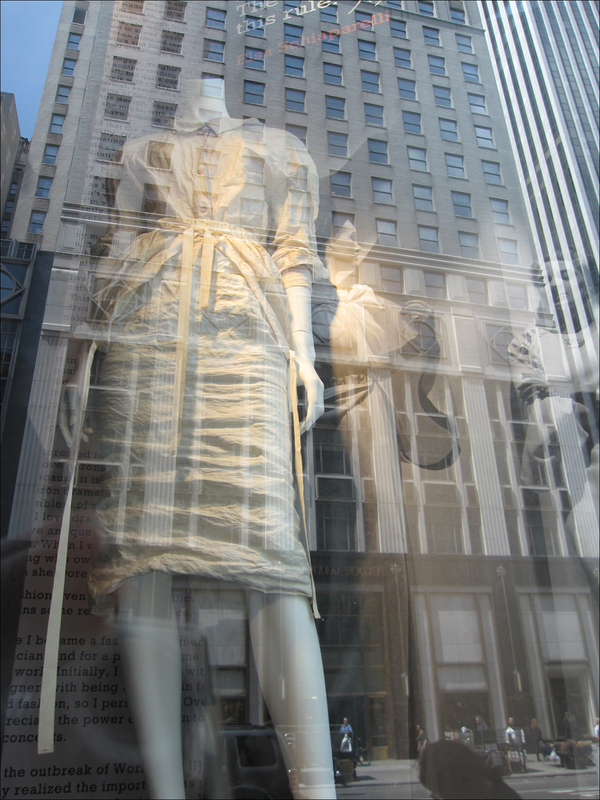 Here is where Holly Golightly bid farewell to the “mean reds,” while lingering over sticky buns and window-shopping. Fanatics of Truman Capote’s “Breakfast at Tiffany’s” book and flick still pay homage, so you might have to wait in line for the picture-perfect shot. Overlooking Central Park, Herman Bergdorf and Edwin Goodman’s flagship opened during the 1920s. This season its vitrines salute the “Schiaparelli & Prada, Impossible Conversations” exhibition at the Metropolitan Museum of Art. Meet my favorite designer. Mad about Dada and Surrealism, Elsa Schiaparelli worked with artists like Jean Cocteau, Dali, and Man Ray. A publicity maven, Schiaparelli would launch her collections with circus performances, complete with prancing elephants and daredevil tightrope walkers outside her “Schiap” shop at Place Vendôme in Paris, Oh, la la. 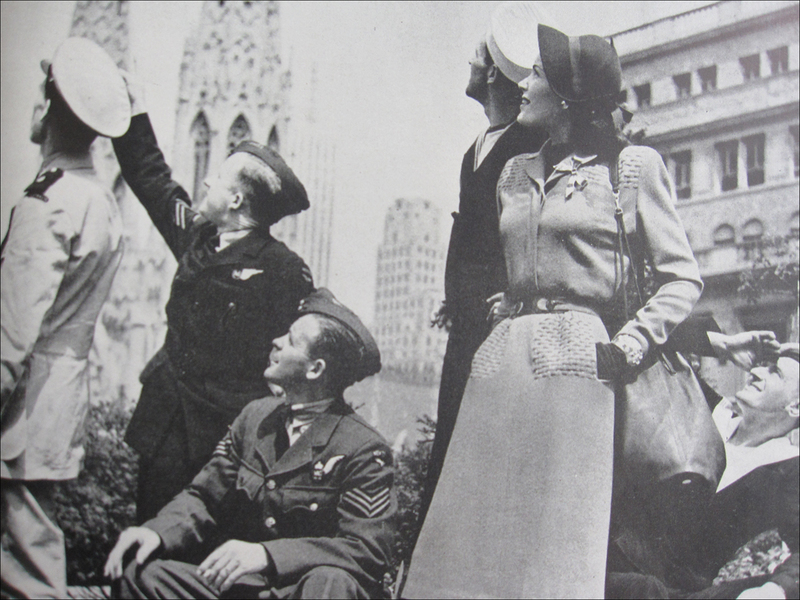 Film buffs: Do keep your eyes peeled also for the Plaza Hotel at 750 5th Avenue and Central Park South. Located next to Bergdorf Goodman, “The Way We Were” is just one of the many movies to feature the photogenic hotel. Wiping away the salty tears in my eyes, “Yes, Hubbell, your girl is lovely!” Just thinking of the film gets me all emotional! After a much-needed crying jag (and pretzel break) at the “Abundance” fountain, let’s now hotfoot it to Barneys. Rebounding just got easier! Come hither! After Haberdasher Barney Pressman pawned off his wife’s engagement ring for $500 (with her consent!) and forty discounted suits, he opened Barneys during the roaring twenties. “No Bunk, No Junk, No Imitations” was his shop’s slogan! A cross between P.T. Barnum and Florenz Ziegfeld, Jr., Barney hired barrel-clad gals to give away matchbooks stamped with the store’s logo and address. Talk about a store-wide campaign with legs! 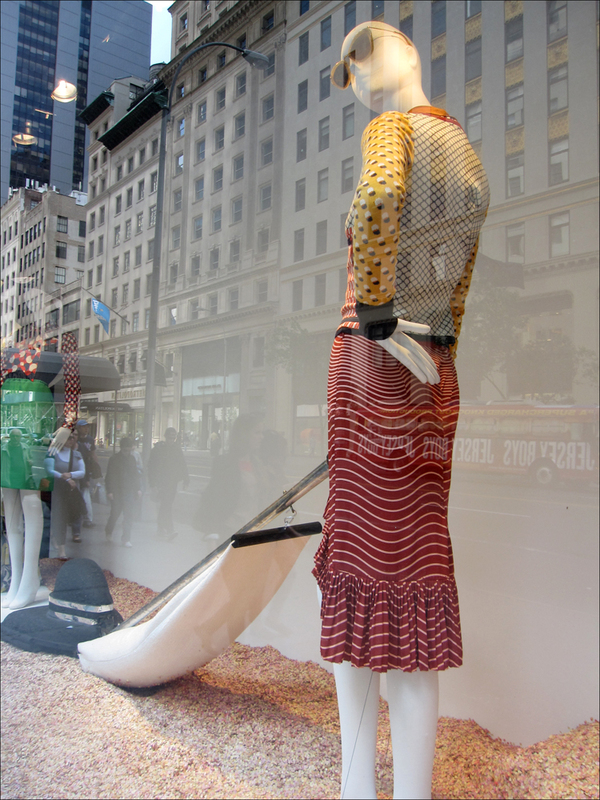 Now let’s wind it back with Elsa Schiaparelli and Miuccia Prada at Bergdorf Goodman. Created by David Hoey, the surreal vitrines doff a “bachi” to the Metropolitan Museum of Art’s springtime Costume Institute exhibition. Wonderful blog as always Theodora. Would love to hear your opinion on the New York versus Parisian macaron! If you happen past a macaron cafe whilst you are on your travels! fan of the black & white yin-yang bliss of pastries? Add that to the list too! Ah, thanks!! You also have a way with quotes! New York is so beautiful during the crisp autumn months. The sky is blue and the temps are low!! T.
That last photo’s your best Reflection so far! Theadora….what a fun post! I absolutely love the nostalgia along with your awesome photos. Such a good read! Oh you are welcome. No one can look through your window without finding something to smile about! I love the idea of making the reflections part of the photos! It’s like looking at mannequins exiting the ghosts of buildings. Très cool! Great post – well researched too. Love the old B&Ws and the reflections. theodora, the mix of pictures looks great! Theadora, you have a nice word for everyone. So much positive energy! Big hug. You made me remember how much I love New York!! Cool pics and oh-so creative. Your blog is a joy to read. Bravo!! I loved how the old photos and new images (yours) complemented each other–literally “reflecting” across the decades. I’m sure Roman tourists stood on the steps of the Greek Parthenon posed in exactly the same way as in that “Pretzel Time” shot, thousands of years ago. Human nature doesn’t change. Thanks for all your humanity in how you put this and all your other posts together. It’s always a breath of fresh air after a sleepless night. 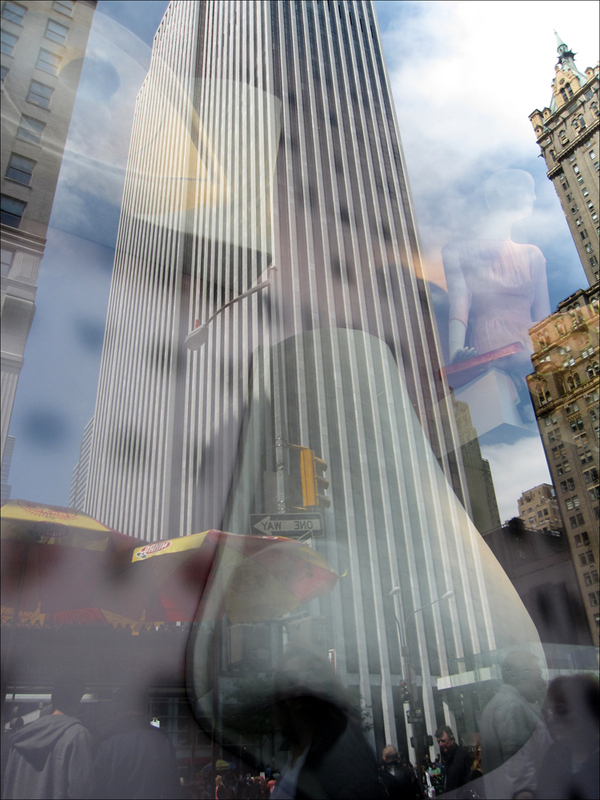 Love your New York Fifth Avenue photos, esp “#20” with the reflection of the coolest 1920s luxury hotel, the Sherry-Netherland in the Bergdorf’s window — layers of fashion and history, timeless, really. Thanks so much for liking my post and blog, too, a very nice complement coming from you. I’m glad you like my site, but I have to confess that my “tag” line is not original. In the 1965 film, “Mickey One,” Warren Beatty, playing a comic on the run and hiding from the mob, has a one-night stand with a woman who afterward pleads with him, “Who ARE you, Mickey One?” I adopted his exasperated response, one of my all-time favorite lines in movies. Thanks – Stop by tomorrow for Asian Noodle Salad. Take care – S.
Of course, it’s better than London’s Oxford Street! You can get almost anything there. AH, but I also love the hustle and bustle of Oxford Street!! T.
Hope to see many, many piccies like this! Wonderful! The old fashioned photos are so nice. Everyone was so polished back then. Too many people look like slobs nowadays. Great post! You have such unique articles and a unique blog! It’s very interesting and informative. Having only visited New York once, I don’t know much about the city besides the major hot (shopping) spots. Love the pics in this post too! Well I’ve only been to New York once but I read a lot of blogs, websites, and magazines featuring New York shopping. SoHo is best for unique (but expensive!) finds and obviously 5th Avenue is the main fashion strip. H&M and Zara are my favorites for cheap, trendy items. Checkout Refinery29.com for more info about shopping in NYC. The well-dressed vacuumer is a beauty. Love the skirt. Love to vacuum. It’s a win-grin!! 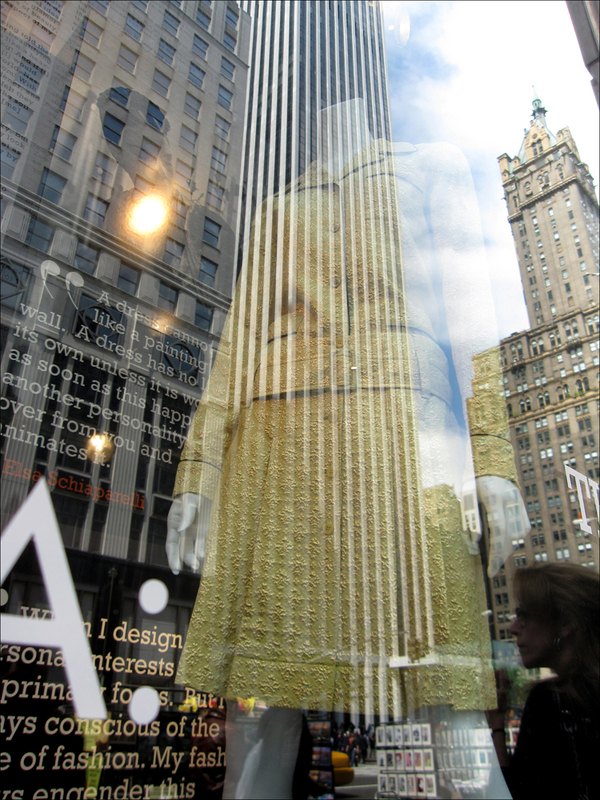 T.
Pingback: New York: Fifth Avenue Window-Shopping Tour (Part 1) « People, Places and Bling!